1 A None No Power Seat 1 A is a First Class seat where the close proximity to the closet may be bothersome. There is no overhead bin storage for this seat. 1 K None No Power Seat 1 K is a First Class seat where the close proximity to the closet may be bothersome. There is no overhead bin storage for this seat. 12 J None No Power Seat 12 J is a standard forward-facing Club World seat. The proximity of the galley may be bothersome. 12 K None No Power Seat 12 K is a standard rear-facing Club World seat. The proximity of the galley may be bothersome. 13 E None No Power Seat 13 E is a standard rear-facing Club World seat. This seat is ideal when traveling with a partner, however, solo passengers may want to select another seat as this one is not very private. 13 F None No Power Seat 13 F is a standard rear-facing Club World seat. This seat is ideal when traveling with a partner, however, solo passengers may want to select another seat as this one is not very private. 14 A None No Power Seat 14 A is a standard rear-facing Club World seat, although proximity to the lavatory and galley may be bothersome. 14 B None No Power Seat 14 B is a standard forward-facing Club World seat, although proximity to the lavatory and galley may be bothersome. 14 D None No Power Seat 14 D is a forward-facing Club World seat, although proximity to the lavatory and galley may be bothersome. There is a bassinet location directly behind this seat so passengers traveling with infants may be seated in this row. 14 E None No Power Seat 14 E is a rear-facing Club World seat, although proximity to the lavatory and galley may be bothersome. This seat is ideal when traveling with a partner, however, passengers flying solo probably want to select another seat as this on is not very private. This is a bassinet location so passengers traveling with infants may be seated in this area. 14 F None No Power Seat 14 F is a rear-facing Club World seat, although proximity to the lavatory and galley may be bothersome. This seat is ideal when traveling with a partner, however, passengers flying solo probably want to select another seat as this on is not very private. This is a bassinet location so passengers traveling with infants may be seated in this area. 14 G None No Power Seat 14 G is a forward-facing Club World seat, although proximity to the lavatory and galley may be bothersome. There is a bassinet location directly behind this seat so passengers traveling with infants may be seated in this row. 14 J None No Power Seat 14 J is a standard forward-facing Club World seat, although proximity to the lavatory and galley may be bothersome. 14 K None No Power Seat 14 K is a standard rear-facing Club World seat, although proximity to the lavatory and galley may be bothersome. 17 D None No Power Seat 17 D is standard forward-facing Club World seat however, proximity to the lavatory may be bothersome. It has been reported that if the lavatory door not fully closed it can occasionally swing out. 17 E None No Power Seat 17 E is a standard rear-facing Club World seat. This seat is ideal when traveling with a partner, however passengers flying solo will probably want to select another seat as this one is not very private. 17 F None No Power Seat 17 F is a standard rear-facing Club World seat. This seat is ideal when traveling with a partner, however passengers flying solo will probably want to select another seat as this one is not very private. 17 G None No Power Seat 17 G is standard forward-facing Club World seat however, proximity to the lavatory may be bothersome. It has been reported that if the lavatory door not fully closed it can occasionally swing out. 18 E None No Power Seat 18 E is a standard rear-facing Club World seat. This seat is ideal when traveling with a partner, however passengers flying solo will probably want to select another seat as this one is not very private. 18 F None No Power Seat 18 F is a standard rear-facing Club World seat. This seat is ideal when traveling with a partner, however passengers flying solo will probably want to select another seat as this one is not very private. 19 E None No Power Seat 19 E is a standard rear-facing Club World seat. This seat is ideal when traveling with a partner, however passengers flying solo will probably want to select another seat as this one is not very private. 19 F None No Power Seat 19 F is a standard rear-facing Club World seat. This seat is ideal when traveling with a partner, however passengers flying solo will probably want to select another seat as this one is not very private. 20 E None No Power Seat 20 E is a standard rear-facing Club World seat. This seat is ideal when traveling with a partner, however passengers flying solo will probably want to select another seat as this one is not very private. 20 F None No Power Seat 20 F is a standard rear-facing Club World seat. This seat is ideal when traveling with a partner, however passengers flying solo will probably want to select another seat as this one is not very private. 28 B None No Power Seat 28 B has some extra legroom due to the exit row. The tray table is in the armrest, making the armrest immovable and slightly reducing seat width. There is no floor storage for this seat during takeoff and landing. 28 D None No Power Seat 28 D has some extra legroom due to the exit row. The tray table is in the armrest, making the armrest immovable and slightly reducing seat width. There is no floor storage for this seat during takeoff and landing. 28 E None No Power Seat 28 E has some extra legroom due to the exit row. The tray table is in the armrest, making the armrest immovable and slightly reducing seat width. There is no floor storage for this seat during takeoff and landing. 28 F None No Power Seat 28 F has some extra legroom due to the exit row. The tray table is in the armrest, making the armrest immovable and slightly reducing seat width. There is no floor storage for this seat during takeoff and landing. 28 G None No Power Seat 28 G has some extra legroom due to the exit row. The tray table is in the armrest, making the armrest immovable and slightly reducing seat width. There is no floor storage for this seat during takeoff and landing. 28 J None No Power Seat 28 J has some extra legroom due to the exit row. The tray table is in the armrest, making the armrest immovable and slightly reducing seat width. There is no floor storage for this seat during takeoff and landing. 29 A None No Power Seat 29 A has plenty of extra legroom due to the missing seat in the row ahead. The tray table and TV are in the armrest, making the armrest immovable and slightly reducing seat width. There is no floor storage for this seat during takeoff and landing. 29 B None No Power Seat 29 B is a standard World Traveler Plus seat. 29 D None No Power Seat 29 D is a World Traveler Plus seat although it may have obstructed legroom due to an equipment box under the seat ahead. 29 E None No Power Seat 29 E is a World Traveler Plus seat, although it may have obstructed legroom due to an equipment box under the seat ahead. 29 F None No Power Seat 29 F is a standard World Traveler Plus seat, although it may have obstructed legroom due to an equipment box under the seat ahead. 29 G None No Power Seat 29 G is a standard World Traveler Plus seat. 29 J None No Power Seat 29 J is a standard World Traveler Plus seat. 29 K None No Power Seat 29 K has plenty of extra legroom due to the missing seat in the row ahead. The tray table and TV are in the armrest, making the armrest immovable and slightly reducing seat width. There is no floor storage for this seat during takeoff and landing. 30 A None No Power Seat 30 A is a standard World Traveler Plus seat. 30 B None No Power Seat 30 B is a standard World Traveler Plus seat. 30 D None No Power Seat 30 D is a standard World Traveler Plus seat. 30 E None No Power Seat 30 E is a standard World Traveler Plus seat, although it may have obstructed legroom due to an equipment box under the seat ahead. 30 F None No Power Seat 30 F is a standard World Traveler Plus seat, although it may have obstructed legroom due to an equipment box under the seat ahead. 30 G None No Power Seat 30 G is a standard World Traveler Plus seat. 30 J None No Power Seat 30 J is a standard World Traveler Plus seat. 30 K None No Power Seat 30 K is a standard World Traveler Plus seat. 31 A None No Power Seat 31 A is a standard World Traveler Plus seat. 31 B None No Power Seat 31 B is a standard World Traveler Plus seat. 31 D None No Power Seat 31 D is a standard World Traveler Plus seat, although this seat may not fully recline as there is a bulkhead immediately behind. 31 E None No Power Seat 31 E is a World Traveler Plus seat, although this seat may not fully recline as there is a bulkhead immediately behind. This seat may have obstructed legroom due to an equipment box under the seat ahead. 31 F None No Power Seat 31 F is a World Traveler Plus seat, although this seat may not fully recline as there is a bulkhead immediately behind. This seat may have obstructed legroom due to an equipment box under the seat ahead. 31 G None No Power Seat 31 G is a standard World Traveler Plus seat, although this seat may not fully recline as there is a bulkhead immediately behind. 31 J None No Power Seat 31 J is a standard World Traveler Plus seat. 31 K None No Power Seat 31 K is a standard World Traveler Plus seat. 33 A None No Power Seat 33 A may have restricted legroom due to the bulkhead. The tray table is in the armrest, making the armrest immovable and slightly reducing seat width. There is no floor storage for this seat during takeoff and landing. This is also a bassinet location and passengers traveling with infants may be seated in this area. 33 B None No Power Seat 33 B may have restricted legroom due to the bulkhead. The tray table is in the armrest, making the armrest immovable and slightly reducing seat width. There is no floor storage for this seat during takeoff and landing. This is also a bassinet location and passengers traveling with infants may be seated in this area. 33 C None No Power Seat 33 C may have restricted legroom due to the bulkhead. The tray table is in the armrest, making the armrest immovable and slightly reducing seat width. There is no floor storage for this seat during takeoff and landing. This is also a bassinet location and passengers traveling with infants may be seated in this area. 33 D None No Power Seat 33 D may have restricted legroom due to the bulkhead. The tray table is in the armrest, making the armrest immovable and slightly reducing seat width. There is no floor storage for this seat during takeoff and landing. This is also a bassinet location and passengers traveling with infants may be seated in this area. 33 E None No Power Seat 33 E may have restricted legroom due to the bulkhead. The tray table is in the armrest, making the armrest immovable and slightly reducing seat width. There is no floor storage for this seat during takeoff and landing. This is also a bassinet location and passengers traveling with infants may be seated in this area. 33 F None No Power Seat 33 F may have restricted legroom due to the bulkhead. The tray table is in the armrest, making the armrest immovable and slightly reducing seat width. There is no floor storage for this seat during takeoff and landing. This is also a bassinet location and passengers traveling with infants may be seated in this area. 33 G None No Power Seat 33 G may have restricted legroom due to the bulkhead. The tray table is in the armrest, making the armrest immovable and slightly reducing seat width. There is no floor storage for this seat during takeoff and landing. This is also a bassinet location and passengers traveling with infants may be seated in this area. 33 H None No Power Seat 33 H may have restricted legroom due to the bulkhead. The tray table is in the armrest, making the armrest immovable and slightly reducing seat width. There is no floor storage for this seat during takeoff and landing. This is also a bassinet location and passengers traveling with infants may be seated in this area. 33 J None No Power Seat 33 J may have restricted legroom due to the bulkhead. The tray table is in the armrest, making the armrest immovable and slightly reducing seat width. There is no floor storage for this seat during takeoff and landing. This is also a bassinet location and passengers traveling with infants may be seated in this area. 33 K None No Power Seat 33 K may have restricted legroom due to the bulkhead. The tray table is in the armrest, making the armrest immovable and slightly reducing seat width. There is no floor storage for this seat during takeoff and landing. This is also a bassinet location and passengers traveling with infants may be seated in this area. 34 C None No Power Seat 34 C is a World Traveller seat. This seat has limited foot room and under-seat storage space due to the presence of an entertainment equipment box. 34 D None No Power Seat 34 D is a World Traveller seat. This seat has limited foot room and under-seat storage space due to the presence of an entertainment equipment box. 34 G None No Power Seat 34 G is a World Traveller seat. This seat has limited foot room and under-seat storage space due to the presence of an entertainment equipment box. 34 H None No Power Seat 34 H is a World Traveller seat. This seat has limited foot room and under-seat storage space due to the presence of an entertainment equipment box. 35 C None No Power Seat 35 C is a World Traveller seat. This seat has limited foot room and under-seat storage space due to the presence of an entertainment equipment box. 35 H None No Power Seat 35 H is a World Traveller seat. This seat has limited foot room and under-seat storage space due to the presence of an entertainment equipment box. 36 A None No Power Seat 36 A has limited recline due to the wall behind and the proximity of the lavatory and galley can be very bothersome, as passengers often congregate right by this seat. 36 B None No Power Seat 36 B has limited recline due to the wall behind and the proximity of the lavatory and galley can be very bothersome, as passengers often congregate right by this seat. 36 C None No Power Seat 36 C has limited recline due to the wall behind and the proximity of the lavatory and galley can be very bothersome, as passengers often congregate right by this seat. This seat has limited foot room and under-seat storage space due to the presence of an entertainment equipment box. 36 D None No Power Seat 36 D has limited recline due to the wall behind and the proximity of the lavatory and galley can be very bothersome, as passengers often congregate right by this seat. This seat has limited foot room and under-seat storage space due to the presence of an entertainment equipment box. 36 E None No Power Seat 36 E has limited recline due to the wall behind and the proximity of the lavatory and galley can be very bothersome, as passengers often congregate right by this seat. 36 F None No Power Seat 36 F has limited recline due to the wall behind and the proximity of the lavatory and galley can be very bothersome, as passengers often congregate right by this seat. 36 G None No Power Seat 36 G has limited recline due to the wall behind and the proximity of the lavatory and galley can be very bothersome, as passengers often congregate right by this seat. This seat has limited foot room and under-seat storage space due to the presence of an entertainment equipment box. 36 H None No Power Seat 36 H has limited recline due to the wall behind and the proximity of the lavatory and galley can be very bothersome, as passengers often congregate right by this seat. This seat has limited foot room and under-seat storage space due to the presence of an entertainment equipment box. 36 J None No Power Seat 36 J has limited recline due to the wall behind and the proximity of the lavatory and galley can be very bothersome, as passengers often congregate right by this seat. 36 K None No Power Seat 36 K has limited recline due to the wall behind and the proximity of the lavatory and galley can be very bothersome, as passengers often congregate right by this seat. 39 H None No Power Seat 39 H has some extra legroom, although the proximity of the galley may be bothersome. The tray table is in the armrest, making the armrest immovable and slightly reducing seat width. There is no floor storage for this seat during takeoff and landing. This is a bassinet location, so passengers traveling with infants may be seated in this area. 39 J None No Power Seat 39 J has some extra legroom, although the proximity of the galley may be bothersome. The tray table is in the armrest, making the armrest immovable and slightly reducing seat width. There is no floor storage for this seat during takeoff and landing. This is a bassinet location, so passengers traveling with infants may be seated in this area. 39 K None No Power Seat 39 K has some extra legroom, although the proximity of the galley may be bothersome. The tray table is in the armrest, making the armrest immovable and slightly reducing seat width. There is no floor storage for this seat during takeoff and landing. This is a bassinet location, so passengers traveling with infants may be seated in this area. 4 E None No Power Seat 4 E is a standard First class seat. This seat is ideal if traveling with a companion. 4 F None No Power Seat 4 F is a standard First class seat. This seat is ideal if traveling with a companion. 40 A None No Power Seat 40 A has reduced legroom. The tray table is in the armrest, making the armrest immovable and slightly reducing seat width. There is no floor storage during takeoff and landing. This is a bassinet location, so passengers traveling with infants may be seated in this area. 40 B None No Power Seat 40 B has some extra legroom, although the proximity of the galley may be bothersome. The tray table is in the armrest, making the armrest immovable and slightly reducing seat width. There is no floor storage for this seat during takeoff and landing. This is a bassinet location, so passengers traveling with infants may be seated in this area. 40 C None No Power Seat 40 C has some extra legroom, although the proximity of the galley may be bothersome. The tray table is in the armrest, making the armrest immovable and slightly reducing seat width. There is no floor storage for this seat during takeoff and landing. This is a bassinet location, so passengers traveling with infants may be seated in this area. 40 D None No Power Seat 40 D has some extra legroom, although the proximity of the galley may be bothersome. The tray table is in the armrest, making the armrest immovable and slightly reducing seat width. There is no floor storage for this seat during takeoff and landing. This is a bassinet location, so passengers traveling with infants may be seated in this area. 40 E None No Power Seat 40 E has some extra legroom, although the proximity of the galley may be bothersome. The tray table is in the armrest, making the armrest immovable and slightly reducing seat width. There is no floor storage for this seat during takeoff and landing. This is a bassinet location, so passengers traveling with infants may be seated in this area. 40 F None No Power Seat 40 F has some extra legroom, although the proximity of the galley may be bothersome. The tray table is in the armrest, making the armrest immovable and slightly reducing seat width. There is no floor storage for this seat during takeoff and landing. This is a bassinet location, so passengers traveling with infants may be seated in this area. 40 G None No Power Seat 40 G has some extra legroom, although the proximity of the galley may be bothersome. The tray table is in the armrest, making the armrest immovable and slightly reducing seat width. There is no floor storage for this seat during takeoff and landing. This is a bassinet location, so passengers traveling with infants may be seated in this area. 41 C None No Power Seat 41 C is a World Traveller seat, however this seat has limited foot room and under-seat storage space due to the presence of an entertainment equipment box. 41 G None No Power Seat 41 G is a World Traveller seat, however this seat has limited foot room and under-seat storage space due to the presence of an entertainment equipment box. 41 H None No Power Seat 41 H is a World Traveller seat, however this seat has limited foot room and under-seat storage space due to the presence of an entertainment equipment box. 42 C None No Power Seat 42 C is a World Traveller seat, however this seat has limited foot room and under-seat storage space due to the presence of an entertainment equipment box. 42 H None No Power Seat 42 H is a World Traveller seat, however this seat has limited foot room and under-seat storage space due to the presence of an entertainment equipment box. 43 C None No Power Seat 43 C is a World Traveller seat, however this seat has limited foot room and under-seat storage space due to the presence of an entertainment equipment box. 43 H None No Power Seat 43 H is a World Traveller seat, however this seat has limited foot room and under-seat storage space due to the presence of an entertainment equipment box. 44 C None No Power Seat 44 C is a World Traveller seat, however this seat has limited foot room and under-seat storage space due to the presence of an entertainment equipment box. 44 H None No Power Seat 44 H is a World Traveller seat, however this seat has limited foot room and under-seat storage space due to the presence of an entertainment equipment box. 45 C None No Power Seat 45 C is a World Traveller seat, however this seat has limited foot room and under-seat storage space due to the presence of an entertainment equipment box. 45 H None No Power Seat 45 H is a World Traveller seat, however this seat has limited foot room and under-seat storage space due to the presence of an entertainment equipment box. 46 C None No Power Seat 46 C is a World Traveller seat, however this seat has limited foot room and under-seat storage space due to the presence of an entertainment equipment box. 46 H None No Power Seat 46 H is a World Traveller seat, however this seat has limited foot room and under-seat storage space due to the presence of an entertainment equipment box. 47 C None No Power Seat 47 C is a World Traveller seat, however this seat has limited foot room and under-seat storage space due to the presence of an entertainment equipment box. 47 H None No Power Seat 47 H is a World Traveller seat, however this seat has limited foot room and under-seat storage space due to the presence of an entertainment equipment box. 48 C None No Power Seat 48 C is a World Traveller seat, however this seat has limited foot room and under-seat storage space due to the presence of an entertainment equipment box. 48 H None No Power Seat 48 H is a World Traveller seat, however this seat has limited foot room and under-seat storage space due to the presence of an entertainment equipment box. 49 C None No Power Seat 49 C is a World Traveller seat, however this seat has limited foot room and under-seat storage space due to the presence of an entertainment equipment box. 49 H None No Power Seat 49 H is a World Traveller seat, however this seat has limited foot room and under-seat storage space due to the presence of an entertainment equipment box. 5 E None No Power Seat 5 E is a standard First class seat. This seat is ideal if traveling with a companion. 5 F None No Power Seat 5 F is a standard First class seat. This seat is ideal if traveling with a companion. 50 C None No Power Seat 50 C is a World Traveller seat, however this seat has limited foot room and under-seat storage space due to the presence of an entertainment equipment box. 50 H None No Power Seat 50 H is a World Traveller seat, however this seat has limited foot room and under-seat storage space due to the presence of an entertainment equipment box. 51 B None No Power Seat 51 B is a highly desired World Traveler seat due to the extra space in the place of the window seat, but this extra space prevents you from leaning against the wall. Also, because this row is not aligned with the row ahead, the in-seat TV screen is off-center, and the seat anchors may be in your way. As one of the only twosomes in the World Traveller section, this seat is ideal when traveling with a partner. 51 C None No Power Seat 51 C is a World Traveller seat, however this seat has limited foot room and under-seat storage space due to the presence of an entertainment equipment box. As one of the only twosomes in the World Traveller section, this seat is ideal when traveling with a partner. 51 H None No Power Seat 51 H is a World Traveller seat, however this seat has limited foot room and under-seat storage space due to the presence of an entertainment equipment box. As one of the only twosomes in the World Traveller section, this seat is ideal when traveling with a partner. 51 J None No Power Seat 51 J is a highly desired World Traveler seat due to the extra space in the place of the window seat, but this extra space prevents you from leaning against the wall. Also, because this row is not aligned with the row ahead, the in-seat TV screen is off-center, and the seat anchors may be in your way. As one of the only twosomes in the World Traveller section, this seat is ideal when traveling with a partner. 52 B None No Power Seat 52 B is a highly desired World Traveler seat due to the extra space in the place of the window seat, but this extra space prevents you from leaning against the wall. Also, because this row is not aligned with the row ahead, the in-seat TV screen is off-center, and the seat anchors may be in your way. As one of the only twosomes in the World Traveller section, this seat is ideal when traveling with a partner. 52 C None No Power Seat 52 C is a World Traveller seat, however this seat has limited foot room and under-seat storage space due to the presence of an entertainment equipment box. As one of the only twosomes in the World Traveller section, this seat is ideal when traveling with a partner. 52 H None No Power Seat 52 H is a World Traveller seat, however this seat has limited foot room and under-seat storage space due to the presence of an entertainment equipment box. As one of the only twosomes in the World Traveller section, this seat is ideal when traveling with a partner. 52 J None No Power Seat 52 J is a highly desired World Traveler seat due to the extra space in the place of the window seat, but this extra space prevents you from leaning against the wall. Also, because this row is not aligned with the row ahead, the in-seat TV screen is off-center, and the seat anchors may be in your way. As one of the only twosomes in the World Traveller section, this seat is ideal when traveling with a partner. 53 B None No Power Seat 53 B feels cramped due to the curvature of the fuselage and the proximity of the lavatories can be bothersome. Also, this seat has limited recline due to the bulkhead behind. As one of the only twosomes in the World Traveller section, this seat is ideal when traveling with a partner. 53 C None No Power Seat 53 C feels cramped due to the curvature of the fuselage and the proximity of the lavatories can be bothersome. Also, this seat has limited recline due to the bulkhead behind. This seat has limited foot room and under-seat storage space due to the presence of an entertainment equipment box. As one of the only twosomes in the World Traveller section, this seat is ideal when traveling with a partner. 53 H None No Power Seat 53 H feels cramped due to the curvature of the fuselage and the proximity of the lavatories can be bothersome. This seat has limited foot room and under-seat storage space due to the presence of an entertainment equipment box. As one of the only twosomes in the World Traveller section, this seat is ideal when traveling with a partner. 53 J None No Power Seat 53 J feels cramped due to the curvature of the fuselage and the proximity of the lavatories can be bothersome. As one of the only twosomes in the World Traveller section, this seat is ideal when traveling with a partner. 55 D None No Power Seat 55 D is in the last row of this aircraft and may have limited recline. Proximity to the lavatories may be bothersome. This seat has limited foot room and under-seat storage space due to the presence of an entertainment equipment box. 55 G None No Power Seat 55 G is in the last row of this aircraft and may have limited recline. Proximity to the lavatories may be bothersome. This seat has limited foot room and under-seat storage space due to the presence of an entertainment equipment box. 60 A None No Power Seat 60 A has limited storage in the overhead bin and side wall due to the shape of the fuselage. The upper deck is usually very quiet and has good service. This seat has a small additional storage box near the window. 60 B None No Power Seat 60 B has limited storage in the overhead bin and side wall due to the shape of the fuselage. This seat can be noisy and bright as it directly faces the lavatory. The upper deck is usually very quiet and has good service. 60 J None No Power Seat 60 J has limited storage in the overhead bin and side wall due to the shape of the fuselage. The proximity to the lavatory may be bothersome as it can be bright and noisy. The upper deck is usually very quiet and has good service. 60 K None No Power Seat 60 K has limited storage in the overhead bin and side wall due to the shape of the fuselage. The proximity to the lavatory may be bothersome. The upper deck is usually very quiet and has good service. This seat has a small additional storage box near the window. 61 A None No Power Seat 61 A is a standard Club World seat. This seat has a small additional storage box near the window. The overhead bins are smaller than standard and do not hold large roll-aboard luggage. The upper deck is usually very quiet and has good service. 61 B None No Power Seat 61 B is a standard Club World seat. The overhead bins are smaller than standard and do not hold large roll-aboard luggage. The upper deck is usually very quiet and has good service. 61 J None No Power Seat 61 J is a standard Club World seat. The overhead bins are smaller than standard and do not hold large roll-aboard luggage. The upper deck is usually very quiet and has good service. 61 K None No Power Seat 61 K is a standard Club World seat. This seat has a small additional storage box near the window. The overhead bins are smaller than standard and do not hold large roll-aboard luggage. The upper deck is usually very quiet and has good service. 62 A None No Power Seat 62 A has extra legroom due to the exit row and the ability to get in and out of this seat without disturbing the passenger in the next seat. The upper deck is usually very quiet and has good service. The overhead bins are smaller than standard and do not hold large roll-aboard luggage. This seat has a small additional storage box near the window. 62 B None No Power Seat 62 B is a standard Club World seat. The overhead bins are smaller than standard and do not hold large roll-aboard luggage. The upper deck is usually very quiet and has good service. 62 J None No Power Seat 62 J is a standard Club World seat. The overhead bins are smaller than standard and do not hold large roll-aboard luggage. The upper deck is usually very quiet and has good service. 62 K None No Power Seat 62 K has extra legroom due to the exit row and the ability to get in and out of this seat without disturbing the passenger in the next seat. The upper deck is usually very quiet and has good service. The overhead bins are smaller than standard and do not hold large roll-aboard luggage. This seat has a small additional storage box near the window. 63 A None No Power Seat 63 A is a standard Club World seat. This seat has a small additional storage box near the window. The overhead bins are smaller than standard and do not hold large roll-aboard luggage. The upper deck is usually very quiet and has good service. 63 B None No Power Seat 63 B has extra legroom due to the exit row. The overhead bins are smaller than standard and do not hold large roll-aboard luggage. The upper deck is usually very quiet and has good service. 63 J None No Power Seat 63 J has extra legroom due to the exit row. The overhead bins are smaller than standard and do not hold large roll-aboard luggage. The upper deck is usually very quiet and has good service. 63 K None No Power Seat 63 K is a standard Club World seat. This seat has a small additional storage box near the window. The overhead bins are smaller than standard and do not hold large roll-aboard luggage. The upper deck is usually very quiet and has good service. 64 A None No Power Seat 64 A is a standard Club World seat. This seat has a small additional storage box near the window. The overhead bins are smaller than standard and do not hold large roll-aboard luggage. The upper deck is usually very quiet and has good service. 64 B None No Power Seat 64 B is a standard Club World seat. The overhead bins are smaller than standard and do not hold large roll-aboard luggage. The upper deck is usually very quiet and has good service. 64 J None No Power Seat 64 J is a Club World seat, although proximity to the lavatory, galley, and stairs may be bothersome. The upper deck is usually very quiet and has good service. The overhead bins are smaller than standard and do not hold large roll-aboard luggage. 64 K None No Power Seat 64 K is a Club World seat, although proximity to the lavatory, galley, and stairs may be bothersome. This seat has a small additional storage box near the window. The overhead bins are smaller than standard and do not hold large roll-aboard luggage. The upper deck is usually very quiet and has good service. Was given this seat after a delayed flight rebook. Not as bad as SeatGuru would have you believe and not that close to the restrooms... about 10-15 feet away. However, the window seat in this configuration has a bit more space and might be preferable unless you are a die-hard aisle guy. All of the BA Club World business class seat are awful and not competitive with other airlines. They are very narrow, without any resting place on either side. The next seat neighbor is right on top of you. For most seats you either need to climb over someone to get out or have someone need to climb over you. The reading light is inadequate. There is no seat storage for personal items next to or behind the seat. Super quiet. No one uses the front bathroom on the upper deck. It was like having my own cabin. flew last thursday 17 august ord-lhr. i found to be the worse business seat on earth, too narrow, no place to store any magazines, fake 180 seat as it is in 2 parts you have to arrange yourself, too much passages from eco to the bathroom out front, passenger on 19g had her feet in front of my face, the champagne cocktail on the ground was turned, had to wait an hour before getting another drink, food rating was poor, their premium eco is so much better with only 8 seats accross just like the narrow business class!!!!!!!!! never again! This is a great seat with plenty of privacy and leg room and you can get to the isle without disturbing other passengers. However, British Airways' entertainment system is absolutely horrid compared to Lufthansa, Emirates, and Icelandair (the three other airlines I've flown recently with onboard entertainment). Very nice as it was in a small cabin for a flight from Seattle to London. Row 50 is the last row with a 3-4-3 configuration. The aisle is at it's most narrowest here meaning that seats C and H are subjected to countless bumps from the cabin crew and other passengers. Terrible seat for sleeping/resting in. Comfortable and private seat - 64A, my favorite, is not available to pre-book when you fly with miles. LOTS of storage - 3 whole bins within reach. Luckily, I'm slim enough to squeeze between the seat and window to get out rather than jumping over the feet of the pax next to me. Since 62 is the exit row, there's plenty of room to walk across after getting behind my pod. Premium seat with 64A. Extra side cabin storage space and lots of windows. This faces the rear wall of the cabin. No issues getting in and out of the seat multiple times. USB port and an additional power outlet was a huge plus to charge up on a long flight. Travelled from LHR to ORD on July 6th, 2016. Great Seat. Great Service. Would choose this seat again. Much more private then those seats 4E/F, 5E/F. Travelled from LHR to ORD on July 6th, 2016. Great Seat. Great Service. My son liked this first class seat better then the first class seat on AA (777). Would choose this seat again. The best seats in premium economy especially if you are travelling by yourself. No one next to you, and tons of legroom. Fantastic seats. This seat was very tight for me being just over 6 ft tall.It was very hard to get in and out when flat .There is no storage around the seat, apart from a small personal wardrobe to hang a jacket, but nothing for small items, glasses etc.There is no overhead bin, the nearest one is over seat 2, too small for a full size cabin bag, or larger over seat 3.Controls took a while to figure out. I travel mostly on American and this seat 1K first class is about as good as their business class in the new 777 ER planes but is nowhere near as spacious as their first class.There are no snacks available between meal courses.Overall the cabin is too crowded. It would be far better if there was one less window seat each side and only one seat in the middle instead of two. Middle seats have no privacy at all.There is little difference between BA first class and business class but a huge difference in the price. The toilet door is unable to make contact with seat 17d. The toilet door on the right hand side of the aircraft for 17 g&j s an inward folding door and cannot swing out. Free entertainment, massive window, great seat! BA's First class cabin on G BNLF is pathetic. Worn out seating, non operational sleeper seats. Will never use BA again. Best seat in Club. Quiet upper deck and private as access to the aisle does not involve climbing over anyone. In-flight entertainment box underneath seat in front limits legroom. I was travelling this plane from LHR to JFK. This was my very first time in a 747, and it was great. This plane is relatively old, which means the seat alignment was made in a time, when passenger satisfaction was an existing thing. So theres plenty of space for your leg even in economy class, the seat is comfortable, adjustable, etc. Despite the oldfashioned IFE, I would rather choose this one again, than a new AA 777-300ER, which has ultra-tight economy class seats. I loved this flight from start to finish. I can't say enough good things about this seat and flight. First off, I love BA's blue mood lighting when stepping on board. I loved the service from start to finish and how the FA's had alot of attention to detail. The only thing I would have changed about this flight is the duration. I wish it was longer. Extremely poor definition screens stop and static, became unwatchable. No WiFi. No functioning electrical outlet. Horribly narrow and cramped. The flight attendant's arm was continually in my face while serving other passengers because the aisle is too narrow. The passenger in 49B and I kept rubbing arms - neither of us was larger than average in an way. No way to put luggage under the seat in front because of IFE box. Not recommended at all. The Club World seats are too narrow at 20". I was uncomfortable with my shoulders scrunched against each side of the wrap around seat. One's shoulders cannot overhang the seat! With a 72" pitch the flat bed seats did not allow for me to lay flat on the 8 hour plus flights from MIA to LHR and return. Overall I felt claustrophobic as if I was packed in a sardine can. (I'm not obese, just a well built 6'1" guy.) I'm a frequent long haul traveler and this was my first and last encounter with that type of seat and British Airways. As an added inconvenience the entertainment system was broken on the return floght 0209! I cant believe BA still operate a plane with this fit put so a 10 hour plus flight. As if the leg room as is provided is not small enough they then have an "entertainment box" fitted in the middle of your so called leg room!!! Unacceptable on this day and age where electronics are getting smaller. Cant see the need to still have this box. This seat also has a long strip on the floor making it hard to get in and out of the seat with socks on. Especially when the seat infront is reclined. I recently had the opportunity to fly this "old" configuration between Dubai and LHR, followed by the same seat (1A) on a 773 to Chicago. I see that some people have criticized either the plane or its features -- and there's no denying that it's clearly older metal than the 777 -- but on whole I actually *preferred* this old dog, with the admitted caveat that I happened to (unusually for me) be flying in First. The seats on this craft and the 777 are virtually identical, with fairly minor variations that I assume are related to the two jets' differing electrical layouts. Plug locations vary; on the 747, for instance, there's a USB port just below the monitor screen, which is mildly inconvenient if you happen to have the screen closed (but need the cord attached to some piece of gadgetry you're using). I don't know about other classes, but I had no problem at all plugging in my standard 110V U.S. plugs to charge both my laptop and mobile phone (without any type of adapter needed). Seat-wise -- and this is admittedly somewhat subjective -- I don't think there's any real comparison between the feelings of flying in the front row of the lower level of a 747 and doing the same on a 777. On the 747 (either version, really), you enjoy a feeling of privacy nearly on par with flying on a private jet. It's not quite as good as FC on, say, Singapore -- which has a single front-row seat, situated in the middle, and you can't see anyone else without turning nearly 180 degrees backwards -- but it's close. While there's admittedly a coat closet in-between the left and right front-row seats, it's not used except before takeoff and after landing -- if it's used at all. (My flight was in late May, so there were no coats to hang. I used it to store my roller bag, actually.) The only other difference between FC on the 747 and 777 is marginally reduced leg room, owing to the curvature of the 747's nose (and your proximity to the very front of it). You *might* notice it if you have the seat fully flat and happen to be a tall male -- which happens to describe myself -- but it's not enough to qualify as irksome. Finally, there are some very minor differences between the two planes' IFE systems (again, in First), but nothing I'd consider significant. Both have the same-size screens and on-demand programming, which are the two key points. very comfortable seat with all new amenities in 1st. Class. Excellent comfort and service on day flight to Boston. This seat is okay however entertainment system is older and could do with updating for e.g. there was no usb charging point, moveable remote, screen was poor quality, entertainment system was slow and often difficult to select things, I travelled on a newly refurbished 777-200 on my outbound flight and that was the complete opposite. Howerer the 747s are getting old. Seat is calm but easy to get in and out due to exit row. And I love the upper deck. great choice. Great seat, as on the window but can get out without climbing over the passenger in 14B. Lavatory noise not an issue. Good seat for economy standard, extra room to right suitable for stretching legs or putting bag, however staggering of seats in front means actual under seat space restricted. My flight was BA (codeshare) so seats relatively comfortable. I would pick this seat again if bulkhead seats were unavailable. This aircraft is very OLD. Small and antiquated video display. Worn out seats. Choose a dirrerent carrier if you are willing to pay a premium for "economy plus"
These seats are excellent if you have longer legs as there is extra leg room due to basinette options. I would definately rebook these rather than a window seat. The one thing I noticed about this seat is that the recline is not as full as it is for other business class seats because the exit cannot be blocked. 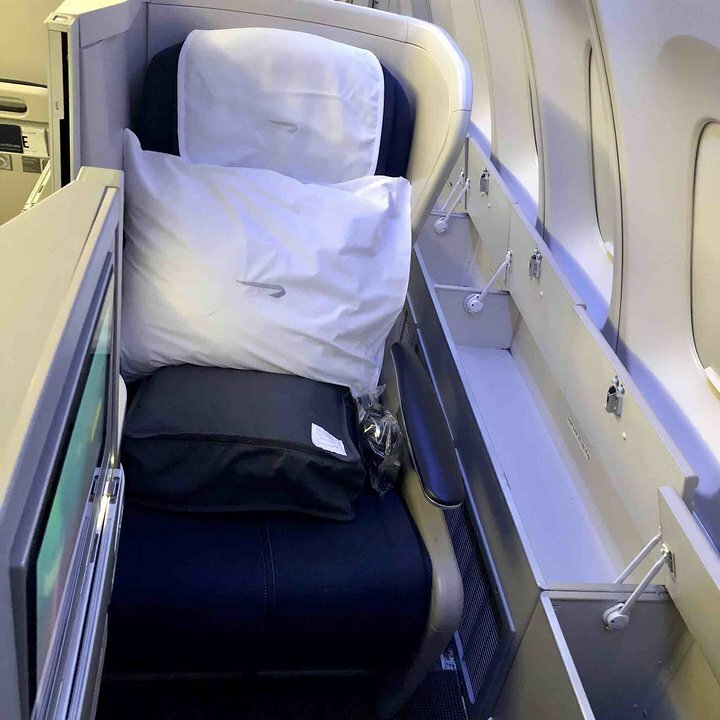 Accordingly, the seat does not go fully flat (the head is angled upward slightly, like having a second pillow) because the flat bed is not as long as the others in the cabin. I sat in 61A on my return and that seat went fully flat from head to foot. The most uncomfortable seat. There is an electronic box under the seat and the the seat is narrow, similar to a seat on a commuter plane. Plane is so old, the entertainment screen is small and it has no USB outlet to charge a cell phone. As with most BA business seats, the window seats are reversed so the proximity to the lavatory is of no issue. Please add that due to the window box storage, these upstairs window seats all have far greater personal space than any other seat on the aircraft, including any first class seat! I flew from LHR-BOS in December and was fortunate to be upgraded from WT, to WT+, and at the last minute to Business! The cabin service was superb: staff are attentive to all your needs and provide excellent care. The selection of food and drinks was incredible, and I made full use of the snack bar in the galley too. The seats are incredibly comfortable, and once you get over the initial awkwardness of the rear facing seat next to you in 18K is a great seat overall. My only criticisms would be that the screens on this 747-400 are showing signs of aging, and the sliding tray table is unsuitable for full glasses (I spilled a glass of red wine on myself and the wall of the seat. Cabin crew were kind enough to assist with the cleanup, however it was an avoidable incident overall). There may be other airlines out there with better and more modern cabins, but BA's customer service are far superior to any airline I've flown with. That's why I continue to fly BA, and as a result of my Executive Club status and loyalty I'm often rewarded with upgrades on busy flights! For me, this was a good seat - it's rear facing (which doesn't bother me), and because it's the last row in the cabin, it's facing a bulkhead. This also means that you don't climb over someone's legs to get out, you just slide around the back of 20J. Power was the standard US plug on the flight to SFO and ditto the way back. This is a great seat in PE, loads of leg room as there is no seat in front of you, you can actually rest your feet on this table thing at the side of seat 28J and you can walk straight out into the aisle without asking someone to move. My only gripe is that as there is no seat in front, you have your tv from out of your arm rest and you have to stow that away during take off and landing. I like to start the in flight entertainment immediately as I board. If that doesnt bother you, this is the seat for you. Luanda flight (BA77) uses 747 with Empower type DC sockets rather than the AC power mentioned. Premium economy seat headrest digs into shoulders as doesn't adjust far enough up (am 6'2"), and very easy to operate in-flight entertainment inadvertently due to the placement of the remote. Worth considering a special meal request, as on Luanda flight, you will get either "African beef stew" or "African chicken stew" if seated anywhere after the first row of premium economy. Window too far away to lean comfortably against. Video screens small and 4:3 rather than the more recent widescreen which was fitted to the 777-300 that used to fly on this route. nice seat with an interesting view from the windows. Very quiet cabin and had no issue with the cabinet between 1A and 1K. Over head bins are very small throughout the cabin. 63J is marked as a good seat. It is, but only if you are tall and the additional legroom / footroom resulting from the emergency exit and the siting of the crew jumpseats is important to you. If not, it is no different to the other upper deck isle seats. Whilst the bubble is quieter and service is great (20 seats v 2 crew) the deck does flex a bit so people walking to and fro results in quite a lot of stomp stomp. Window seats are clearly the best but generally the preserve of gold card holders. In summary, 63J is a good seat if you are taller than the 6', otherwise its just an isle seat. This seat has a heating outlet that directs a lot of heat directly into the foot area. It was so hot I had to move to another seat before take-off (on the advice of the cabin crew). Avoid this one. Great seat with lots of space and privacy plus don't have to climb over anyone to get out. Upper deck has great service. Only complaint is the atrocious TV screen; ancient, very small and poor picture quality making entertainment system useless for anything other than flight tracking. Each time I've gotten on this flight, or the return flight, I've hoped for an updated screen but it hasn't happened. It's either sleeping or reading for me. Excellent location and pretty good set up - very roomy pod - Except: 1) entertainment system didnt work - forced to relocate to less private row 5. 2) no fan at seat - far too hot to sleep (folded WSJ into fan to stop sweating) bring personal fan! Windows too far away to see ground. Attendant kept nagging me to take my food (after telling me I could order food on my timetable). I was so excited upon boarding but was so underwhelmed upon disembarking. The aircraft is somewhat dated and ambience does not quite measure up to business class on Qatar Airways. The selection of movies could be improved upon. There are adequate power sockets - you would need to carry an adaptor for the UK style plug. No USB port is available. Very good service on upper deck. The bulkhead only extends to the middle of the seat, allowing for a bit of a stretch. This aircraft has aging amenities: small low definition TVs, less storage space, no power! This is a perfectly comfortable Prem Econ seat. I kept accidently activating the remote control wih my leg, so i guess the seats didnt feel that wide. But there was more than enough leg room & the tray tables folded out ok. I was flying from Riyadh to London Heathrow in May. I was flying on a 747 jet in business class. The flight departed at 00:35. All through the flight the quality of food, drink and service was outstanding. I arrived at London at 05:25 and I thought to myself that the flight I was on was a flight I wouldn't forget. I would definitely recommend flying with BA. 28B is a private, sole seat near the exit door, but it is extremely draughty and cold; and there is no overhead bin directly above it, and no slot for storage on the wall in front. Premium economy is not worth the money, the space is completely overbooked and all space taken every flight I've had lately, and the food is terrible. Might as well fly economy, it is an exhausting and disgusting experience on BA. Not enough toilets, and the staff are so few and so busy they don't collect food trays for ages and ages. I flew from MEX to LHR on this 10-hour overnight flight. The seat is extremely quiet given its closeness to the galley. As there is a closet between the seat access to the aisle and the galley, you hardly notice the noise or the lights at the galley. I will book this seat again without a doubt, as it is located in the front section of Club World, which only has 2/3 rows of seats. This seat's access to the aisle is perfect as you don't have to jump over your neighbor's feet and you have a whole big overhead bin for yourself. 63J - Day time flight to Houston from Heathrow. Not as private as the window seats but top deck is very quiet and this seat had lots of space. A little restricted on storage. 64A - Travelled back overnight from Houston to Heathrow. 11 hours. Great flight, seat is so private and the upper deck so quiet. After a bite to eat - head down and fast asleep. There is ample storage space and various windows to look out from. The baby balconet is here but looked like it had not been used in a long time. No problem getting out of this seat as there was nothing to climb over. 2 cabin crew for the 20 seats. Not a great seat for 6"" and above. THE BAD: It is more narrow than 18" should be, the elbow rests are hard, bumpy, very low, on each there is a fixed control unit, you will be switching channels and changing volume - for your neighbor at 40A as well. The entertainment unit stopped working after 2 minutes. The screen is tiny, some functions (map) do not work at all. The airplane feels very noisy inflight compared to B777 or A380 flying similar routes. They run out of food choices just around this row of seats. Bring your own water and food - they serve twice for 12 hours flight. Too little storage for luggage. 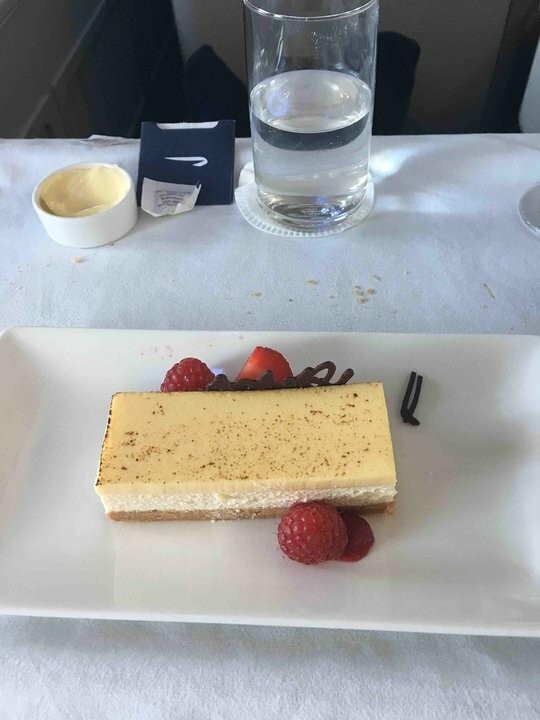 THE GOOD: BA service is pleasant, food was good tasting, seat felt very hard but turned out to comfortable for 12 hours flight, enough toilets available, entertainment system accepts normal headphones and the selection of titles was just as big as the other recent BA flights. Comfortable. I'm 5'10" and was able to sleep well. Good meals, attentive crew. This seat at the bulkhead has no one forward who would need to step over your feet. I'msold on this seating system. No ventilation above this seat; very hot on the overnight flight from DFW-LHR. A/V kept quitting after 10 minutes or so. Not what I'd expect from the fabled "1A" at all, despite its being the new First cabin. I've had more comfortable flights in cattle. An excellent seat for taller people. I'm 6'3" and my feet touch the seat in front on a standard ClubWorld flat bed. This seat offers its own little cocoon of privacy, no one to step over, loads of storage in the side bins and a good 12" more leg room than 64k. Two stewardesses for 20 people makes for great service too. Slight downsides are a bit of unwanted light from the nearby toilet during night flights and the stewardesses have to walk past you each time they serve the upper deck so you get a bit of 'stomp-stomp!' The pros for this seat massively outweigh the cons. Comfortable seat. The cabin is not very noisy and there is no lavatory in the front on that side causing increased foot traffic. Didn't like having to step over the feet of the passenger in 14J to get to the aisle. There was a considerable amount of noise from the Galley about 1 hour before the second meal was served. TV screens are old and dim and need to be replaced. Great seat on a recent MIA-LHR flight. Quiet with the screen up and no problem being in the rear near the Galley or lavatory. Liked the direct aisle access. The TV screens are small and dim and need to be replaced. While I agree that this was the best business seat choice and while the bed was super comfortable, the personal entertainment is a complete joke. It shows a murky image like an old tv from the 1970s. It was unwatchable. Finally, in this day and age, I expect paid wifi available especially on a long flight but there was none. I fly this route at least 6 times a year and any seat on the upper deck is better than on the main deck. Period. Much quieter and much less traffic. Of the seats on the upper deck, as has been said, this seat means you don't disturb anyone and there is tons of locker space. I like to get 64K if I can as that is more private and you get off first, which if you have hand luggage only, is important. 60 through 63 are further behind when disembarking. This seat is great for the night flight home. You are served first and then you can settle down into the flight. If you sleep well on board this is the seat for you. Great service as 2 attendants for 20 passengers. Good seat at the back of the Club section. Next to the curtain for PE, but PE passengers can not come through. It is away from the galley and toilet, so very quiet. As it is at the bulkhead, 20A has direct aisle access with no feet to step over. I would sit on the upper deck if possible but otherwise, this is a good seat. I am 6'5" tall and there is no other seat on the plane where I can really stretch out my legs. Probably the best club world seat I've ever flown - tons of space between the seat & bulkhead (no seats between)so you can walk right out of the seat to the aisle. Four separate cubby holes in the window seat for storage so no need to use overhead locker. Upper deck is quiet, with 2 FA for 20 pax, 2 toilets & only 4 seats across. I'll be looking to fly this again. 64J, and probably 64B are the least desirable upstairs...too much lav and flight attendant traffic....everything else is great! We were able to upgrade to Club World fairly cheaply, and this was one of the few seats available. Others' comments about having to crawl over others to reach the aisle are correct. Once the foot rest is lowered in the front facing seat next to you, you must step over it and the feet of the person in it to get out. Also, my husband accidentally hit the button for the privacy panel a couple of times as he stepped over. I found the panels to be irritating on the whole of it, because the flight crew had to constantly lower them to communicate with us. These seats are better than coach, but not nearly as desirable as on the upper deck. I have sat in seat 28J many times and find it to be an excellent PE seat. You are on your own with nobody to disturb you and there is extra space for small personal items. 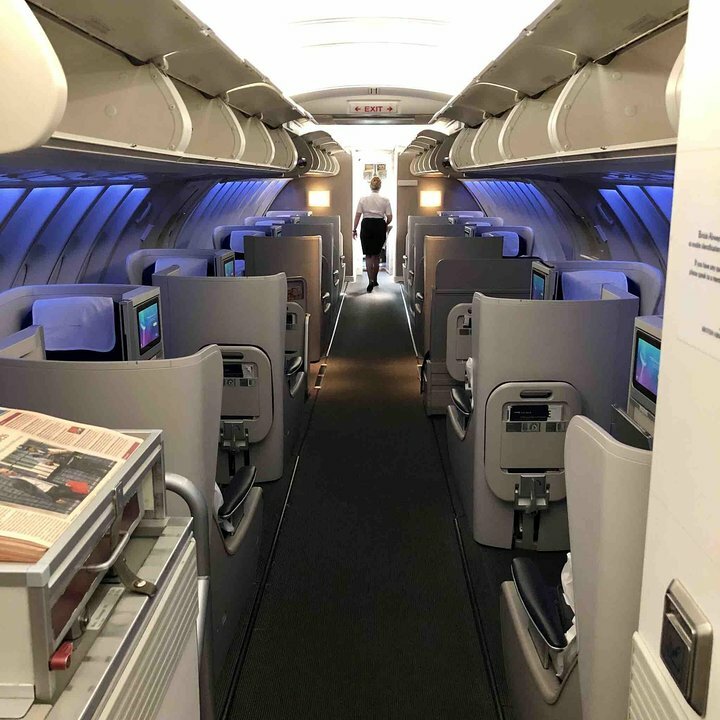 However, BA has not converted the PE section on their 747's to the new design, so the seats are not as comfortable as the newer ones on the 777 and the video system is pretty bad. Not a good seat at all. For someone over 6' tall the legroom is extremely limited and the proximity of the bulkhead makes it feel rather claustrophobic. The seat width is quite narrow which is exacerbated by the pivoting arm of the PTV digging into your leg. I would not choose this seat again. travelled out on Jan 1 and back on 6 Jan. Fantastic seat on a quiet, upper deck. By far the best BA club seats. Great feature is the side locker at ground level providing more space. Perfect. If a larger build (like myself) I do not recommend this seat. The width of the seat is considerably narrower and the hinge of the TV will dig in to your leg. The plus is it does come with significant extra legroom and nobody will recline in to you... if slim, it is probably a great seat. Sat in an aisle seat for the first time in a long time. Unlike the window seats in biz class on this aircraft, the aisle seats have extremely limited storage and no cubby holes for things like glasses or water bottles. Theres a small, inconveniently placed drawer on the floor but it is difficult to reach in lie flat mode. There's no storage for a briefcase or handbag. Everything has to go in the overhead for take off and landing. If you put up the awkward footrest, you can't reach your items. The entire set up is very poorly designed. I'm going to do my best to avoid aisle seats on this plane on my return flight. Great seats as these two rows are separated by the emergency exit aisle. Lots of storage space under windows for seat A and K. Having traveled this route several times (SEA to/from LHR) rows 62 and 63 are our preferred seats if first class booked. Upper cabin has two attendants serving 20 passengers similar to First that has 2 serving 14. As others have said, one of the best seats in Club World (together with 62A, and 64A/K) Very private, direct aisle access and enough storage space. Overall experience on upper deck is a lot better than on main deck, feels like a different class. Like a review of seat 17A, I found this seat was very hot mid-back -- uncomfortably so -- when the seat was reclined flat. While otherwise a significant improvement over Premium Economy and Economy, this seat was difficult to get out of when the aisle seats were reclined. We had to step over bodies and their belongings in order to get to the aisle. This is the seat with the heat exchanger , it is behind the fridge which outputs very hot air. It was unbearable. The flight staff are fully aware of this problem. Thankfully the moved me. Best seat in the World Traveller Plus class. It was a overnight flight. Plenty of leg room and no one sitting beside you to disturb you. Worth the upgrade from Economy. Very good seat. Lowered into flat bed. Slight tilt. Very comfortable. Plenty of room to stretch out. Being next to aisle actually provided more room to move around. Being near restroom was not a problem. Area quiet. Cabin lights dimmed during most of flight. Excellent service by flight attendants. Food was excellent. 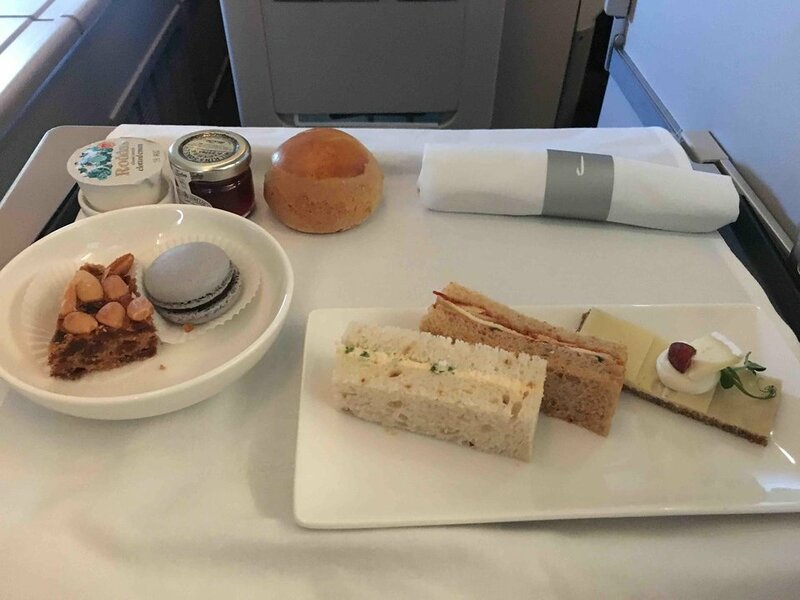 Best airline food I have ever had (Have flown first class on other airlines). Afternoon tea served later in flight. I will definitely fly BA again when I travel to London. Under this seat there is a a refrigeration heat exchanger - the result being that the seat is extremely hot for the first part of the flight. This is well known to the cabin crew who covered the offending area with blankets etc But you had to complain before anything was done. An excellent seat with no one immediately behind you. I prefer the aisle, which prevents having to climb over anyone on this long, overnight flight. I was a little bit nervous after researching and reading about the comments about the seat. Everyone was talking how 64A is the best seat ever. I think 64K is a great seat. It is very private, I never heard any noise from the bathrooms, I slept great and I was never woke up by noises. I think this is a good seat because you dont have any one at the end of your feet and you can just walk out of the seat without having to jump or see someone in the face. 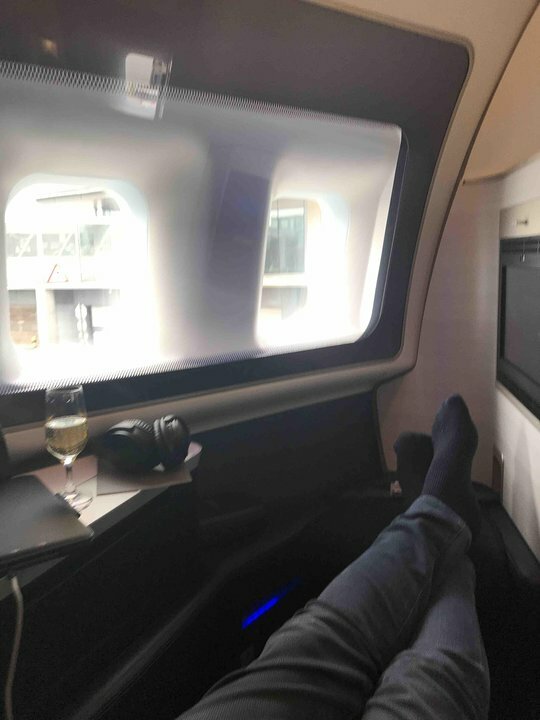 I cannot believe BA tries to pass this as First Class. It is tight, uncomfortable, one of the worst designs ever. There is zero room to store anything during the flight, not even a small pocket to put a pair of glasses. The seat is narrow, hard uncomfortable when flat. Same goes for all other First Class seats. It's a scam! Buyer beware. One of the best CW seats. Being a bulkhead you dont have to climb over anyone. Being starboard side on way to usa means you get darkness and can sleep. Stewards are closest so you get quick attendance. Seat 64A is surely one of the best upper deck seats on the BA 747-400, especially for a single traveller. It's best if you want to get some sleep, as it's almost like being in a "cocoon", hiding you from the rest of the cabin with no distractions. It's also generally very quiet, on the opposite side to any facilities.